In my previous post, I discussed the importance of understanding what you need to change before beginning an ERP implementation. Once you’ve determined what you really need to change, the next question you need to ask is: how to change. The answer to this question includes the detailed roadmap for your change (e.g. methodology, timing or phasing, key resources, etc). However, due to resource constraints, very few organizations – if any – can make all of those changes at once and be successful. That is where this question can help. From an ERP implementation perspective, we use the capability roadmap to define when the key aspects of capability should be delivered. Our preferred method to determine the most effective sequence for an implementation project is to consider the relative complexity/risk of a change step versus the benefit expected from the step. The complexity and/or risk of a given functional area of scope is typically dependent on the amount of innovation or customization required to deliver that functionality. In other words, any scope area where the functionality is standard, proven or based on existing best practices is typically easier and less risky to implement than a scope area that has to be created, customized or implemented for the first time. Benefit or value is the result of an impact on either improved profitability or risk mitigation. From a profitability perspective, the area most likely to be affected is revenue (i.e. through the ability to either increase price or quantity, or both). The only real mechanism a company has to increase volume and/or price is through differentiation. So in order to identify areas of maximum value, a company needs to understand how a change in a given capability will create either a reduction in risk or an increase in differentiation. 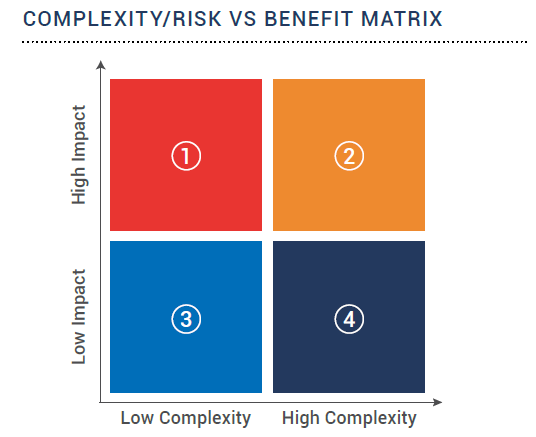 As a general rule, the sequence of scope to be implemented is as numerated in Figure 1: First the low complexity, high impact (benefit); second high complexity, high impact; third low complexity, low benefit and generally last (or never) high complexity low impact.